Join us over three Wednesday evenings in September, for a 21st Century Skills and Competencies Symposium, where we'll discuss how we can future proof our students for successful futures. The three sessions will each have a special focus, with expert guest speakers (to be announced) to address the audience and stimulate discussion. We encourage parents, senior secondary students and members of our local community to attend as many sessions as you are able! You will be notified when registrations via Eventbrite will open. There is no charge to attend the event. Session One will focus on what skills are needed in the 21st Century, particularly for young people entering the workforce. We want to share with parents, students and the wider community what skills employers will be looking for, and what jobs will look like as we progress through the 21st Century. Session Two will focus on what educators can be doing now to prepare students for these changing conditions. We'll investigate how students are accessing technology and how we can be enabling students to develop core competencies such as critical thinking, reasoning, collaboration, creativity, and communication. 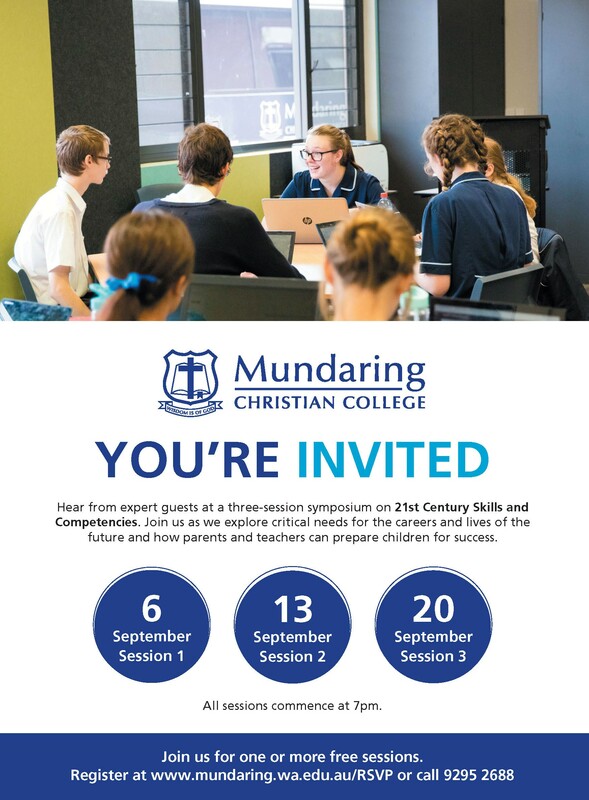 Examples will be drawn from Mundaring Christian College's programs. Session Three has a 'think tank' focus on what we can do better together with the wider community and by partnering with parents to ensure students leave Year 12 with these key 21st Century Skills. We'll be inviting leaders from the local Chamber of Commerce and Industry, employers, local Councillors and community leaders. We strongly encourage parents to attend. Feel free to share this information, as this event is open to all members of our local community. Further details will follow in due course.